The Wall Street Journal reports that China seeks a new market in its own backyard. —Gao Sen in Beijing contributed to this article. HOHHOT, China -- China is turning to its poorer residents to help revive growth as demand flags among the wealthy Western consumers who have long gobbled up the country's exports. In the latest measures to spur domestic consumption, China's government on Monday announced plans to create jobs, lower distribution costs and improve the quality and availability of products sold in rural areas. As part of the effort, the Ministry of Commerce said, the government aims to help establish 150,000 stores in the Chinese countryside this year to offer rural residents easy access to safe consumer goods. Such stores could create 775,000 new jobs by 2010, the ministry estimated. The new projects, though still short on detail, highlight economic planners' growing focus on encouraging China's roughly 700 million rural residents to spend more. Among other recent measures are state subsidies for farmers to buy electrical appliances. The government hopes these efforts will help rejuvenate flagging growth and improve prosperity among rural residents, at a time when increasing unemployment has raised concerns about potential social unrest. China's exports have declined in recent months after years of growing at double-digit rates. Economists and officials say China needs to stimulate consumption to compensate for the slowdown, not only for its own economic health but to help rebalance a global economy whose biggest consumer, the U.S., is in recession. Domestic consumption contributed about 39% of China's gross domestic product for the first nine months of last year, according to official Chinese statistics -- compared to about 69% of GDP in the U.S. Authorities face some big challenges in cracking the rural market. Rural residents, whose average annual income is about $700 a person in China, tend to save much of that income for a rainy day because of the weakness of health care and other social services in the countryside. Spurred by a government subsidy plan, He Cuifeng and Hu Erhe bought their first washing machine last month. Ms. He and Mr. Hu, who live in a remote rural area, say the machine is seen as a status symbol in their village. However, while rural residents are still relatively poor, their incomes have grown steadily during China's three decades of market-oriented reforms. Foreign companies including cellphone giant Nokia Corp. and drug maker AstraZeneca PLC have moved in recent years to tap that demand by building distribution networks in smaller Chinese cities. Beijing began its program to provide 13% subsidies to rural residents on purchases of electronic goods such as cellphones, washing machines and personal computers in 2007 in three provinces. It went nationwide this month. The government has designated more than 120 companies as suppliers, including foreign concerns such as Nokia and Samsung Electronics Co. The subsidies could cost the government 30 billion yuan a year, or about $4.4 billion [pennies compared to other stimulus measures being taken], according to Li Guoxiang, a researcher at the Chinese Academy of Social Sciences, a government think tank. Rural residents still often don't have easy access to well-stocked stores. Hu Erhe, a 56-year-old farmer here in the northern Chinese territory of Inner Mongolia, last month paid 598 yuan, nearly half his monthly income, to buy his first washing machine, using the government subsidy. He and his wife, He Cuifeng, lugged it back to their remote village in a two-hour ride on a public bus. They don't have running water at home, so Ms. He pumps water from their nearby well into large earthenware jugs to transport to the house. The machine has become a status symbol in the village, Ms. He says. "Lots of neighbors came around to look." Lenovo Group Ltd., China's largest PC maker, estimates the subsidy plan could boost industry sales in China by 10 billion yuan, or about 5% percent of the annual total. The company said last week that it plans to refocus on the Chinese market amid weak demand in the U.S. and Europe. Companies involved in the plans say selling to rural residents can have real financial rewards. Haier Group, China's largest maker of home appliances, reported an 8% increase in revenue in 2008 to $17.8 billion, which executives attributed in part to the subsidy program. Rural sales overtook urban sales for the first time in the company's history last year. 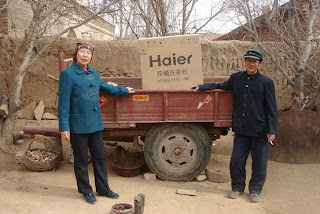 Haier and other companies including Panasonic Corp. modify products to suit rural conditions -- compensating for uneven electricity supplies, for instance. The subsidy plan is "a way for a global brand to sink roots in the China market," says Panasonic. The commerce ministry offered few details on its plans. Jiang Zengwei, vice-minister of commerce, pledged on Monday that Beijing's stimulus efforts won't include "Buy China" policies akin to the "Buy American" provision in the U.S. stimulus package [China does need to use “buy China” policies. Its dollar peg makes over twice as expensive as they would otherwise be. With this kind of hidden tariff, a “buy China” policies would be overkill]. The Chinese government has warned in recent months of foreign governments becoming protectionist. "One country cannot satisfy its own demand simply by depending on its own production," he said. China Daily reports that rural home appliance sales grow with subsidy. BEIJING -- Home appliance sales in China's countryside has been stirred up as the government offered subsidies to rural buyers of those products to lift domestic consumption, the People's Daily reported Thursday. In the first 20 days of January, Chinese farmers bought more than 160,000 items of home appliances on government subsidies, 90 percent of the total in December, the newspaper said , citing Ministry of Commerce (MOC) sources. "The expansion of the subsidy program on rural purchase of home appliances has magnified the purchasing power of rural residents by seven times and gradually accelerated sales since the beginning of this year," the MOC was quoted as saying. China View reports that financial crisis forces IT makers towards China's countryside. BEIJING, Jan. 19 (Xinhua) -- As the global financial crisis takes hold on China's economy, eroding domestic and international demand, the government is hoping to boost consumption and help the crisis-hit IT industry by subsidizing computer purchases by rural households that have thus far been sidelined in the expansion of new technologies. "The subsidy policy is important to support domestic computer makers in particular in the midst of the financial crisis," says Liu Jie, vice president of Lenovo, the world's fourth largest PC maker. Based on the present rural PC market, Lenovo estimates the policy will stimulate about 10 billion yuan (1.46 billion U.S. dollars) in sales, 5 percent up on the total market volume. "Consumer electronics products, in particular personal computers, are not regarded as a necessity," says Liu, "so IT products makers are vulnerable in times of crisis." So rural areas are an undeveloped market that can help ease the hardship. The China Internet Network Information Center (CNNIC) said earlier this month that the number of Internet users in China jumped almost 42 percent to 298 million by the end of 2008 from the previous year, making it the world's largest Internet population. However, only 84.6 million - less than one third of the total -are from rural areas, where more than 800 million people of the country's 1.3 billion people live. As rural areas lag behind of cities in terms of infrastructure and education, farmers are more in need of training on how to utilize PCs, and of coordinated Internet services providers building a network with more extensive reach. "We are prepared to have to invest in order to make a profit," said a statement from Lenovo. The financial crisis raises other challenges in the rural market. Many export-oriented factories in eastern coastal areas have gone bust, so millions of unemployed migrant workers are returning to their hometowns. "These returning migrant workers are potential customers," says Yan Shunli. "They have to make a living. Computers can broaden their options, by for instance, allowing them to set up their own businesses, selling local specialties online." China Daily reports that China promotes home appliance subsidy program in rural areas. For 10 years, the most valuable household appliance in herdsman Chaolu's home in north China's Inner Mongolia was the 14-inch TV set, purchased when he earned about 4,000 yuan ($580) a year. "I could not bring myself to buy a new TV set, although the old one often failed to work properly. I had to support a family with very little money." Now the old TV has been replaced by a 26-inch LCD color set. "The new TV set looks great. Sharp images and good sound make it worth the money," says Chaolu, 33, who paid 1,950 yuan ($285) for the set in Taipusi Banner, Xilinguole League, two days before last month's Lunar New Year holiday. He also enjoyed a 13-percent subsidy, worth 253 yuan, from the government. "With the money saved, I could buy more than 10kg of mutton. It looks as if the government has sent me a special gift for the Spring Festival." 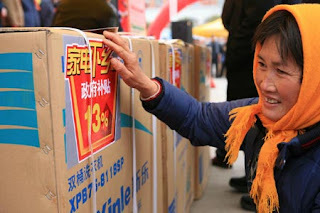 China piloted the subsidy scheme for farmers buying designated brands of color TV sets, refrigerators and mobile phones in the three agricultural provinces of Shandong, Henan and Sichuan, as well as Qingdao City from December 2007 through May 2008. They totaled 197 types of appliances. 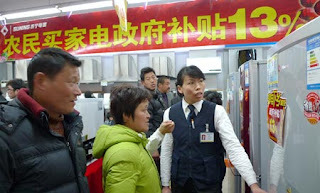 The prices were capped at 2,000 yuan for a color TV set, 2,500 yuan for a refrigerator and 1,000 yuan for a cell phone. The 13-percent subsidy was split 80-20between the central and local governments respectively. Each rural household was allowed to purchase two items from each category and could claim the subsidies at their local township government finance agencies in 15 working days. China, the world's largest producer and exporter of household appliances, also gives a 13-percent tax rebate to household electrical appliance exporters and exports half its production every year, said Zeng Xiaoan of the Ministry of Finance (MOF). "Now, the government will give farmers this benefit to improve their quality of life and to stimulate sluggish rural consumption," said Zeng. The government expanded the scheme to 14 provinces, autonomous regions and municipalities and included washing machines capped at 2,000 yuan in December 2008. Covering 53 percent of the rural population, the scheme will run till 2012. "The rebate made me resolve to spend 1,950 yuan on a new TV," said Chaolu. On February 1, China furthered the scheme throughout the country to benefit all rural people and added four more products: motorcycles, personal computers, water heaters and air conditioners. Local governments could choose two of them according to demand. Huge foreign investment and fast-growing exports have long been major contributors to China's economic development. With the effects of the global financial crisis spreading throughout the world, the government is looking to tap domestic consumption, especially in unexploited rural markets. China's countryside has lagged behind urban areas in sales of home appliances, such as TVs, refrigerators and washing machines. Per capita net income for the 800 million rural residents surged by 8 percent in 2008 to hit 4,761 yuan. The scheme could help steer household appliance manufacturers to rural areas. Zhu Lijun, an analyst from China Galaxy Securities, estimates the policy could promote growth of the refrigerator sector by 20 percent, the washing machine sector by 19.5 percent, and color TV sector by 14 percent, but will have little effect on the mobile phone sector. Despite all the benefits, China needs to overcome problems to truly expand rural consumption with the subsidy program, say industry officials. "Low incomes and insecure social security services directly hamper Chinese farmers' purchasing initiative," says Zhu Changying, deputy head of Anping Town, Nanchong City, a major farm base in southwest China's Sichuan province. The scrapping of the 2,600-year-old agricultural tax in 2006, subsidies to farmers buying better strains of seed and farm machines, and other government measures have helped farmers in Anping Town raise their incomes. In 2008, annual net incomes in the town averaged 4,300 yuan, but farmers spent about 3,000 yuan ayear on food and production materials. "Farmers are no longer so troubled by medical costs since the government introduced the new rural cooperative medical care project in 2003. But they do not have retirement pensions, which is why most choose to save," says Zhu. China View reports that China is aiming for 3.3 trillion yuan restaurant industry by 2013. BEIJING, Jan. 26 (Xinhua) -- China wants its restaurant and catering industry to achieve yearly average growth of 18 percent with a goal of 3.3 trillion yuan (about 478 billion U.S. dollars) in sales by 2013, according to guidelines released by the Commerce Ministry. Other objectives for 2013 include generating 25 million jobs, building 800 staple food processing and distribution centers and opening 160,000 chain breakfast outlets. Between 1991 and 2007, industry sales rose 22.3 percent annually on average. The growth rate was 7.2 percentage points higher than that of total retail sales. The industry so far has employed nearly 20 million people, with another 2 million added each year. But nearly 90 percent of food businesses are small or medium-sized, with the biggest 100 generating only 8.5 percent of total sales. Food outlets serving the general public, rather than offering luxury cuisine, were likely to see their power and water charges cut, said the guidelines. My reaction: China is turning to its poorer residents to help revive growth instead of Western consumers. 1) China's government on Monday announced plans to create jobs, lower distribution costs and improve the quality and availability of products sold in rural areas. 2) The government aims to help establish 150,000 stores in the Chinese countryside this year to offer rural residents easy access to safe consumer goods. Such stores could create 775,000 new jobs for migrant workers by 2010. 4) Among other recent measures to encourage China's roughly 700 million rural residents to spend more are state subsidies for farmers to buy electrical appliances. The subsidy plan could boost industry sales in China by 10 billion yuan, or about 5% percent of the annual total. Beijing began its program to provide 13% subsidies to rural residents on purchases of electronic goods such as cellphones, washing machines and personal computers in 2007 in three provinces. On February 1, China extended the program nationwide and added four more products: motorcycles, personal computers, water heaters and air conditioners. 5) Rural residents, whose average annual income is about $700 a person in China, tend to save much of that income for a rainy day because of the weakness of health care and other social services in the countryside. With the introduction of the new rural cooperative medical care project in 2003, Farmers are concerns with medical costs decreased, and China is expanding social security to deal with retirement concerns. 6) Many companies, such as Lenovo Group Ltd (China's largest PC maker), plan to refocus on the Chinese market amid weak demand in the U.S. and Europe. 7) The subsidy plan is working. Rural sales overtook urban sales for the first time in the company's history last year. Also, in the first 20 days of January, Chinese farmers bought more than 160,000 items of home appliances on government subsidies, 90 percent of the total in December. 8) The financial crisis is forcing IT makers towards China's countryside, to ease the paid of falling global demand for Consumer electronics products. China' s rural areas, especially with state subsidies, are one of the few growing markets for IT products. Chinese Internet users have also become the world's largest Internet population, with their numbers reaching 298 million by the end of 2008. 9) 20 millions of migrant workers who have enjoyed the convenience of Internet are returning home, and many companies, such as Lenovo Group Ltd (China's largest PC maker), plan to refocus on the Chinese market amid weak demand in the U.S. and Europe.. These two factors are sure to increase demand for electronics in rural areas. 10) China aims for its restaurant and catering industry to achieve 18 percent yearly average growth by 2013, with a goal of reaching 3.3 trillion yuan (about 478 billion U.S. dollars) in sales. Between 1991 and 2007, restaurant industry's sales rose 22.3 percent annually on average, and the industry employs nearly 20 million people, with another 2 million added each year. Food outlets serving the general public are likely to see their power and water charges cut, as part of this plan. 11) In 2008, domestic consumption contributed about 39% of China's gross domestic product for the first nine months of last year, compared to about 69% of GDP in the US. A) Give up on their efforts to boost rural spending and brutally suppress domestic demand to bring inflation under control. B) Give up on the dollar peg and aggressively sell off its dollar reserves to bring inflation under control. The solution China will choose is obvious. Its efforts to boost domestic spending are producing double digit growth in its service sector and are raising the standard of living for Chinese across the nation. Meanwhile, the cost of supporting American consumers is higher than ever, with China running record surpluses (around 40 billion each) in the last four months, and the benefits of supporting American consumers are disappearing faster than ever, with Chinese exports falling 17.5% this January. This entry was posted in China, News_Developments, Trade_Deficit. Bookmark the permalink.